I don't like to write in English because I am not so good in English, so I choose Chinese. But because of the new laptop I am using, it is without Chinese software, so I forced to update my blog in English. It is also a good opportunity to let me practice my poor English. We went to Layang-Layangan yesterday evening. What is the reason we went there? Of course is I want to eat Satay!!! 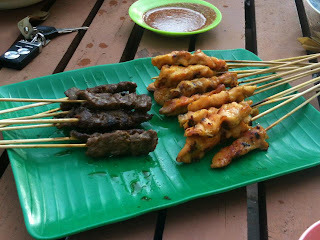 I miss the Satay so so so much! For me, the Satay is nice and cheaper as well. Well, I ate all the beef (10 sticks), 3 sticks of chicken and a bowl of ABC Special. Then the rest are for him!!! At night, around 9.30pm, we went to Black Gold Cafe. We went there because I want to eat salad. Not because I want to keep fit, is because I suddenly want to have it! He choose to eat Grilled Chicken and I choose to eat Chef's Salad. The taste not bad for me, but I prefer Potato's Salad after try this. but I am happy too.